Moto Z2 Appears on AnTuTu, Specs Revealed - Playfuldroid! Motorola is expected to unveil the Moto Z2 and Moto Z2 Force on June 27 as the company has confirmed that it will be holding a launch event on the said date. The Moto Z2 has been benchmarked on AnTuTu as a result of which its specs have been revealed. 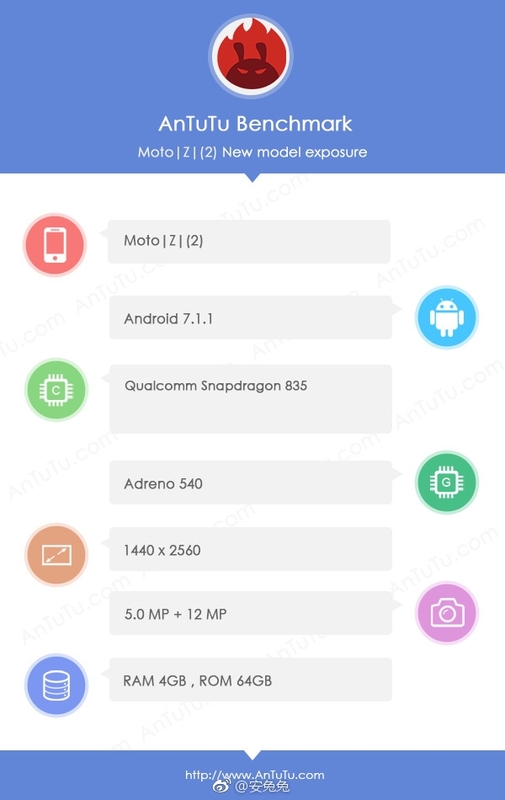 According to AnTuTu listing, the Moto Z2 would be featuring a display that supports quad HD resolution of 2,560 x 1,440 pixels. Rumors have it that the Moto Z2 would be housing a 5.5-inch display. Like most flagship phones of this year, the Moto Z2 is also driven by Snapdragon 835 chipset. The SoC is coupled with 4 GB of RAM and the native storage of the phone is 64 GB. It comes loaded with Android 7.1.1 Nougat OS. It features a dual camera setup. However, the AnTuTu listing shows that it has a 12-megapixel camera. Its selfie camera is of 5-megapixel. Motorola is also expected to launch Moto Z2 Force alongside the regular Moto Z2. The Z2 Force is expected to come with a “ShatterShield” display and sport identical specs as Moto Z2. Both the phones carry support for MotoMods accessories. Samsung Galaxy Note FE Arrival Delayed to July 30?